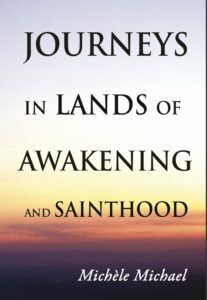 This work of Michele Michael present ten paths of awakening or sainthood including Edward Salim Michael’s path. What convergence is there between the spiritual path of the Theravada master Ajahn Mun and Madame Guyon, the still largely unknown great Christian mystic? Between Gerta Ital, who took the path of the Rinzai school of Zen Buddhism, and Swami Ramdas, who practiced bhakti yoga, the path of devotion? What are the denominators common to these out-of-the-ordinary beings who, in such apparently different ways, have climbed the ladder leading to the ultimate realization? Is this not a question of the greatest importance for a seeker in search of Truth? Is the crux of this not to interrogate oneself over what is at the heart of a spiritual practice, beyond factors that are particular to a culture, an era, or a religion? Finding the universal behind the particular is the approach taken by science; it is also the approach necessary in order to disentangle the essence of spirituality from its various cultural and historical contexts. Five women, five men, Buddhists, Christians, Hindus, ten different journeys, ten different paths. The lives of these inspiring beings are retraced here, firstly, to show that there are and will always be, in no matter what era, people who commit totally to responding to the inner call and, secondly, to shed light on what they had in common, not in order to define a single possible path, but to find what one must pass through without fail, the necessary steps, if one wishes one day to approach, as these beings did, lands of awakening and sainthood. We are living through an unparalleled conjunction of scientific upheavals and dispassionate studies of religions. Never before have we, as we do now, had access to all traditions, to all sacred texts. It is possible for us to see that, in the world’s various cultures, some human beings have consecrated all their strength to ardently questioning the Source of the phenomenal world and that they have attested to knowing It through direct experience. Recognizing that different paths lead to the highest spiritual summits proves a necessary shield against sectarianism and fanaticism. It demonstrates the importance of a plurality of paths, according to the temperament and the aptitudes of each person. However, seeing the value of the fruits of different paths does not, in any way, prevent us showing discrimination regarding beliefs, dogmas, or customs that result from the inevitable degradation affecting all that is born into the manifest world, including spiritual teachings. In days gone by, the person who heard the inner call would follow the spiritual path of the time and the place where life had placed him or her, with no possible choice. Today, it is no longer the same. Through multiplication of information, through abundance of sources, we are naturally led to have a wider perspective and, consequently, to have new and fruitful questions. An initial approach consists in bringing together the sacred texts of various traditions, comparing, for example, The Gospels, The Bhagavad Gita, and The Dhammapada. Nevertheless, this remains an intellectual approach. Other writings have stood the test of time: Plotinus, Shankaracharya, Milarepa, Teresa of Ávila, or Dogen—to quote only a few famous figures—have nourished generations of seekers; they nevertheless belong to a fairly distant past, like Christ or the Buddha. We may think their realizations belong to a bygone era, that conditions have changed and we will not find, in our time, beings capable of attaining the same heights. This is why we need models who are closer to us, who are a testimony to a path that speaks to us here and now. Nothing touches us more than example, the journey of someone whose difficulties and trials one discovers and who offers up his or her own spiritual experiences. Ten different journeys, ten different paths; that is the subject of this book. It is the lives of these inspiring beings that are retraced here, firstly, to show that there are and will always be, in no matter what era, people who commit totally to responding to the inner call and, secondly, to shed light on what they had in common, not in order to define a single possible path, but to find what one must pass through without fail, the necessary steps, if one wishes one day to approach, as these beings did, lands of awakening and sainthood. With the exception of one woman who lived in the seventeenth century, the people whose journeys I have depicted are fairly contemporary, that is to say that the trace of their lives has not yet been effaced, has not yet been deformed by time. There are doubtless many others, but to be able to retrace, to apprehend at least a little of a spiritual journey, it is necessary to have a biography, even if succinct, and some writings, first-hand if possible, or at the very least by people close to the exceptional being we wish to know better. This is not so easy to find among those who have attained the spiritual summits. There have always been mystics who, over the centuries, have lived unknown, within monasteries, in hermitages, or in secular life, and who have not felt the need to transmit their experience in writing. Women, in particular, are few, especially—until very recently—in Buddhism and Hinduism. It is in Christianity, indisputably, that women have had the most opportunities to share the fruits of their spiritual accomplishments. The women and men whose lives and approach I retrace here are ones I have encountered at certain moments of my life; they have touched me, inspired me. Perhaps not all of them attained the same summits, but all are exceptional beings because of their engagement and their sincerity. From their birth, each and every one of them showed qualities developed in other lives, their out-of-the-ordinary capacities being true proof of reincarnation. They brought to this existence the fruit of an inner practice undertaken before; they are a testimony to the possibility, for each and every one of us, of working here and now on what we are in the present, with a view to preparing a different future for ourselves, in order to pursue, with renewed determination, the path towards spiritual realization, that total transformation of the being that frees us from the suffering inherent to the human condition, that brings the ultimate answers concerning the meaning of life and concerning death, that brings peace and felicity, and that proves a source of inspiration to others. This work does not, in any way, claim to be an exhaustive overview of the various paths leading to spiritual realization. There are, in fact, as many paths as there are realized beings, each of them pursues the path that corresponds to what she or he is at a given moment in her or his history. What I have tried to capture here, by way of these ten very different journeys, are the common underlying laws, spiritual laws, just as rigorous as physical laws, to better understand the ultimate goal of an inner path, to better understand the obstacles and better grasp the type of effort to be made. When a seeker of truth succeeds in the total transmutation of his or her being, when the ordinary, personal, and limited aspect of him or herself has disappeared and he or she has become One with the Absolute, the summit of the mountain has been reached. However, the paths are multiple and the danger of losing one’s way represents a not insignificant share of the difficulties of the path. Not everyone sets out from the same place and not everyone arrives at the summit. There is the risk of taking a path that goes around the mountain, rather than climbing it, or of losing oneself in impasses, or beginning the ascent only to abandon it en route, believing oneself to have already arrived, effectively beginning to elevate oneself and, without realizing it, following a path that leads back down, to such an extent do facility, habit, and gravity prove to be the most common traps. Among the small number who attain the summit, some try to mark out the path they have, themselves, followed so that others may engage upon it after them, but, of course, the path is only one part of the necessary conditions, because the quality of the climber is the determining factor. The road is long and the climb is made in several stages; the climber becomes inured, resists the strong winds that blow at high altitudes, finds strength in the beauty he or she discovers as he or she climbs, and leaves on the plains those who are still chained to their attachment to the world of the senses. These remarkable pilgrims call to us through their exigence, but also through sometimes disturbing phenomena that undermine our modern, materialist vision of the world. Their experiences are both comparable and dissimilar, because consciousness seems to have a wider array of possibilities than we generally imagine. Indeed, even if we think we are interested in spirituality, we want to understand everything and we imagine that we can; Western psychology and modern science format us, without us knowing it, and deplete within us the sense of mystery. Consciousness is not a product of the brain, as contemporary scientists implicitly teach our children. Consciousness comes first and is at the origin of all psychic and material manifestations. That is to say that to know the laws at work in the mind is to know what is essential. The Means of Liberation in Tibetan Buddhism. What About Grace as Christians Experience It?